I may open every one of my blogs this way as it still has not sunk in that I am in Antarctica. I’m working at the bottom of the world, in one of the most pristine habitats I’ve ever experienced. I want to fill you in a bit more on some of the small boat work that Andy mentioned yesterday. 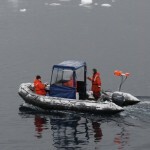 Basically, in good weather the Gould is surveying for marine mammals and seabirds and mapping prey at a broad scale. Concurrently, the small boats are tagging an individual whale and measuring the prey surrounding that whale. 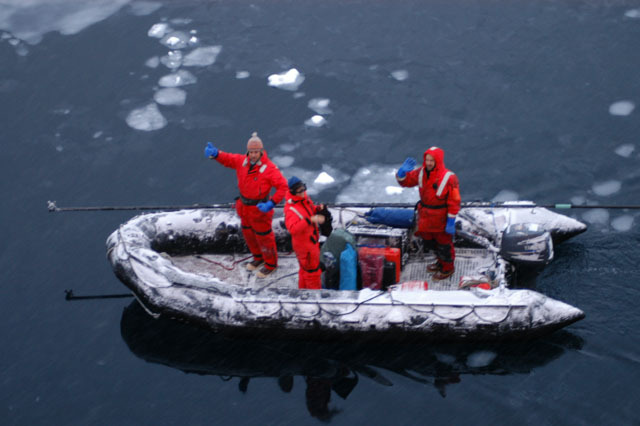 We are operating in two zodiacs: the taggers are exposed to the elements all day long and the prey mapping boat which provides cover for the gear and one scientist under the dodger. Today we got our 2nd and 3rd tags (sequentially not simultaneously) on including our own overnight tag. Being in a small and enclosed bay where we’ve seen animals and prey over multiple days makes leaving a tag on overnight much more safe. We also kept the prey mapping boat out longer today to measure the krill migrating towards the surface and concurrently watching the whales begin to feed. 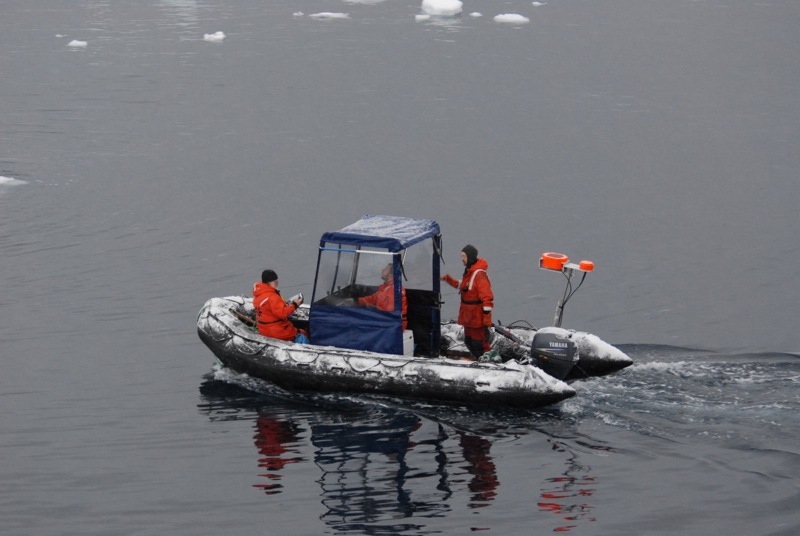 Due to the amount of krill in the water that were observed from the ADCP, the MOCNESS was cut short to only a four-minute tow. Even so, the net was so full of krill that the crew and scientists on shift had to spend about half an hour shoveling the krill overboard. 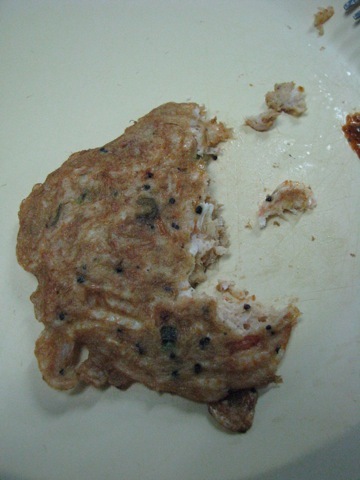 After freezing krill samples for later analyses, the extra krill was used to make breakfast this morning. To me it tasted like extremely oily shrimp, undoubtedly good for migrating whales but not so tasty for my personal preference. You can see each individual krill staring up at you. One of the other amazing things about the trip is experiencing the different ice habitats. I’ve learned there are very specific delineations between ice types. I’ll provide my own very coarse summary. Snow freezing when it hits the below-freezing water becomes a translucent slick on the surface and is called grease ice. If it continues to freeze into a solid layer but then is broken due to wave action, it becomes a thin layer of pancake ice. 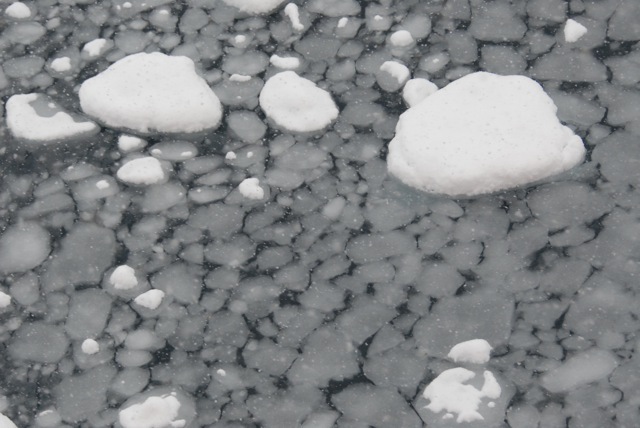 In the winter when the ice forms simply from water freezing, it is known as either fast-ice when attached to land or ice floes when forming in open water. Both of these forms can easily trap a ship that is unprepared. Ice that enters the water after calving from a glacier has a completely difference nomenclature. The smallest bits are known as growlers and are less than 3 meters tall. These are some of the toughest to avoid for the small boats and can make boating much more hazardous. Between 3 and 10 meters in height the glacial discards are known as bergie bits, and taller than 10 meters you have your prototypical iceberg. 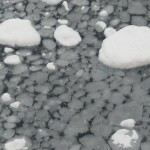 When there are small bits of ice from one or many sources it’s called brash ice and can often choke up a whole bay. Here is an example of brash ice observed from the Gould. There are smaller snow-covered bits from glacial calving but you can also see the thin layer of grease ice covering the rest of the water. I wanted to finish the blog with another picture of the Gould in her element. We are in Wilhemina Bay surrounded on three sides by ice cliffs and glaciers and multiple ice habitats (open grease ice, brash ice, and bergie bits). 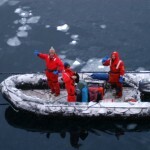 In the photo the Gould is surrounded by light brash ice and has just launched the two zodiacs to begin our workday. We’re hoping for good weather tomorrow to get our 4th tag on, measure some more prey, and continue to examine the ecology of this truly unique environment. 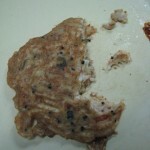 Krill pancakes – that’s some daring human foraging!